Stuart MacGregor (1935-1973) was a Scottish novelist, poet and songwriter who worked as a medical doctor and a lecturer in social medicine. As John Herdman notes, MacGregor’s heart was never in his day-job and much of his energy was expended on his literary and musical endeavours. MacGregor lived nearly all of his life in Edinburgh but he died in a freak car accident in Jamaica while working as a visiting lecturer at the University of the West Indies. MacGregor’s first novel The Myrtle and Ivy (1967) comes directly out of his extracurricular experience of the folk-music and pub scene in Edinburgh while he was a medical student. The novel is arguably rather hamstrung by some florid overwriting but it is of value today for vividly capturing a sense of its time and place. The Sinner (1973) is a more complex prospect of a novel, although it shares with The Myrtle and Ivy the same problem of occasionally wooden dialogue. The Sinner was published hastily after MacGregor’s death and is a more ambitious and well-executed novel but not without some unsavoury baggage from its time, which I’ll return to shortly. It’s worth bearing in mind the main details of MacGregor’s life when reading The Sinner, because it’s strongly autobiographical – at times bordering on roman-à-clef. As such, Sandy Bell’s Bar becomes ‘Connor’s’ and Denis Sellars (the folksinger protagonist who refuses to sell out to a hot-shot London producer) bears some resemblance to MacGregor himself. Ronald Johnstone seems a lot like Norman MacCaig and Hugh MacDiarmid remains himself as the ne plus ultra of Scottish poets. Rollo Wilson Craig and his ‘Spontaneous Fluid’ poets seem to be a cruel caricature of Ian Hamilton Finlay and other concrete poets. Sellars’ mentor, the ‘genius’ older novelist Nichol Ross is highly evocative of Hamish Henderson: Ross served in the Intelligence Corps during the war, travelled across Europe and Scotland in search of folksong and wisdom and he is not beyond getting pugilistic over something that really matters, such as the future of folk-music. We know that Henderson himself wasn’t above raising his fists to certain figures who crossed him intellectually or ideologically. He did punch Norman MacCaig for sneering at the working-class. Throughout the book it’s suggested that Ross might in fact be Sellars’ father and this in itself brings to mind the disputed paternity of Hamish Henderson himself. By anchoring his story in a recognisable historical reality MacGregor brings his novel to life. In addition to this, what distinguishes The Sinner is that it takes conflicts of many kinds – religious, ideological, personal, intellectual – and plants them firmly in the Edinburgh of Knox and Montrose and of the ‘Caledonian anti-syzygy’. Before I hear groans about ‘Edina’s plague’ (‘duality’) I should state that in this novel these are the backdrop to the conflicts and help to intensify Sellars’ ‘sinning’. The novel draws on the ‘folksong flytings’ that dominated the Scottish newspapers in the 1950s and 1960s; between factions espousing essentialist ideas on poetry and song and others who advocated populism or the avant-garde. Here, the fight is between the slick and poppy folk-music that is earning London producers (like the ruthless Len Hackett) a fortune and preserving the purity of the folk-music of the travelling communities of Scotland for future generations. Sellars makes it clear that this is the sort of music people have bled over and the living owe a debt to their ancestors to ensure only the song is passed on in its purest form, not the celebrity of the singer. The battleground is the bodies, ears and minds of those involved, so naturally the novel shows how fealty to a cause or person can be tested to breaking point. Although the novel begins proleptically with a rather garbled and frantic attempted suicide and note by Denis, the rest of the novel unfolds chronologically and works its way up to the show-down, between two rival performances: Len Hackett’s popular televised variety show and Nichol Ross’ revue of poetry, drama and folksong. The novel opens and closes in a rather Hoggian fashion; with that of metatexts (struggling novelists) and found texts (the letters left behind). Thus Ross dies and bequeaths all of his work and knowledge to Denis in the form of manuscripts and letters. Ultimately, the theme of conflict is addressed, not via Knox and duality, but via the work done by figures such as Nichol Ross (Hamish Henderson) to glimpse something greater beyond all the fighting and the egos. One of the uglier aspects of the novel is its shocking attitudes towards women. 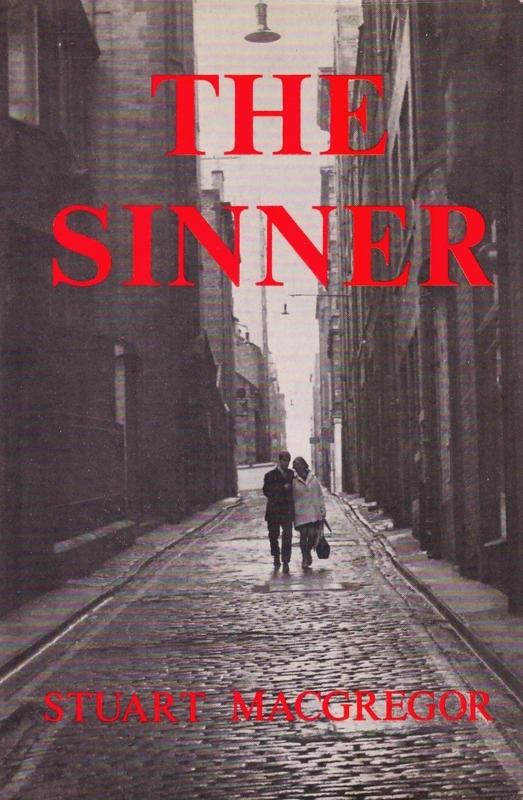 Even for the era of its publication, the 1970s, The Sinner was controversial for its scenes of domestic abuse. There are unpleasant moments of objectification and the Madonna/whore complex rears its unsightly head more than a few times. At his worst Denis treats Kate Fraser abominably – at one point he nearly throttles her – but Nichol Ross intervenes to thrash Denis with his walking stick. While Denis’ misogyny is not tackled head-on, it is challenged at times like these. Much of the talent and creative power in the novel actually lies with the women – Lisa Kendall, the brilliant singer who is used and dumped by Denis, and Kate who writes an outstanding new folksong on an old theme of the ’45 and who offers acute feedback on Denis’ work, which he violently rejects. Sticking my neck far out I’d suggest that Denis’ misogyny must be seen as part of his sinning, and this most egregious sin leading in the end to his salvation. At Denis’ nadir, he loses nearly everything including his sanity, yet Kate remains and it is his love for her, and her love for him, that prevents him from committing suicide. The closing pages of the book are in Kate’s hand, and it is Kate who calls for a reconciliation between Denis and Murdo (his closest friend). Denis realises Kate’s talent, worth and love very late on but the reader is often stunned into disbelief by Kate’s continued forgiveness, which only runs out briefly on one occasion. While The Sinner is at times bawdy and witty, it is ultimately a serious work. One of its lesser themes is supernaturalism and mysticism, which are also present in The Myrtle and Ivy. Denis has premonitions about his own death – he feels doomed and Nichol Ross actually possesses physic foreknowledge about things that are going to happen, such as his own death. While it is perhaps easy to dismiss this thread, it makes the novel a charged and poignant read to those who know that MacGregor himself had ‘a superstitious belief in his own ill destiny’ (Herdman) and was to die, aged 37 in a car crash, before his second novel saw print. Is The Sinner suitable for someone who noisily clapped and cheered when Dylan cased his Martin and strapped on a Fender Strat? Just curious. Where did you come across the description of poor Stuart’s death Richie? I remember once hearing something about it and it made me so sad and I started reading his work immediately. I have a copy of his Poems and Songs also. Hi Peter – the account of his death I heard was from someone who had been on the Edinburgh scene at the same time as MacGregor. Apparently he was driving back home from a friend’s house after celebrating Burns Night and one of the tyres burst and the car crashed into a tree. The old rear-view mirrors in cars were held on by a prong and I think MacGregor ended up being impaled on this. Not sure how much of this, if any, is true but that’s the story I’ve heard.